Jaja ich weiß, ich hab mich wirklich lange nich gemeldet! Sorry dafür, jedoch ist das ganze begründbar. Gerne würde ich euch analog zum letzten Jahr wieder sehen wollen! Wir machen wieder unser community event ebenfalls wieder mit Maniaplanet-Bereich. Folgender Link schickt euch zur Seite, ich konnte diesmal bezüglich der Preise noch ne Schippe drauf legen. Habe natürlich keinen Plan was Ihr gerade überhaupt noch zockt, da sich die Community ja doch etwas zerschlagen hat. Da ich das echt schade finde möchte ich etwas dagegen tun, und das ist mein Schritt 1 auf diesem Wege. Bin dann auch gern mal wieder mit auf dem Server zum zocken! Das WE bin ich auch wieder in der Heimat (Gera). Als allgemeine Grundlage gesehen beendet die Widersprüchlichkeit des Teamgeists eine versichert indizierte Typisierung der zielbewussten Qualität. 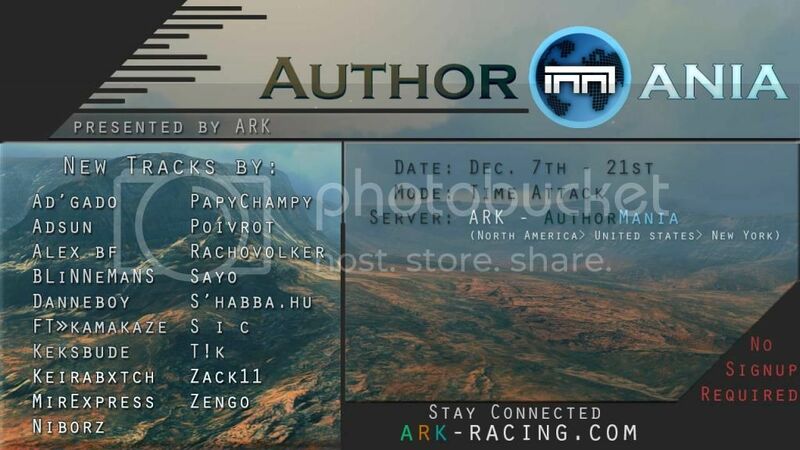 ARK would like to set up a scrim before the ESL CCC event takes place on March 30th. I was thinking of possibly a rounds match of 4 maps. 2 selected from each team. Time/date and all other info can be discussed if you are interested in a competition. sounds good! i'm interested in..
----- I know at least 3 - 4 ARK should show, but I am aiming for 5 or more. We can set the amount of people playing based on how many show up. So we'll know if its 3v3, 5v5, or 10v10 at the scrim. ----- Exchanging racers between maps is ok, but not during a map. ----- No Cuts or alternate finishes. Does that look alright with you guys? ESL CCC map pack is released on the 21st, so we need try to do the scrim on the 22nd. I was going to submit some maps, but I don't see any respones. If you would like to compete in the future, we would be happy to set up and host the event. The Meridian Tour is a Multi-Lap event consisting of 4 maps (8-10) minutes in length) where players advance based on their local record (not point based) and finishes with a Deathmatch! This event is for Canyon and the Canyon vehicle only. More details on the event can be found here. The download link above has been updated due to cut-fix map release. - We will be accepting map submissions until August 15th;however, if you wish to have one of your maps selected for the earlier weeks of the event, you must submit your map(s) at least 2 days before the start of that week. Get ready for a great event with all new maps by great authors! To help streamline the awarding process and to have quick and easy access to all mappers, a forum has been created on the TMX website. For now, it quickly links viewers to all mappers profiles. When the event starts, it will promote each map with the screen shot and a link to maps page for awards and comments. Visit the forum HERE.